My son has just learned how to chain with a crochet hook. He’s made many people lots of cool wristbands and necklaces. This is mine. 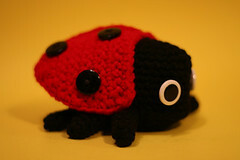 He’s a quick learner and more crochet and knitting lessons will follow. The hat is finished. It didn’t fit me, so my son claimed it as his. 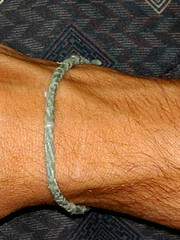 This was a cinch to crochet up and didn’t take long at all. 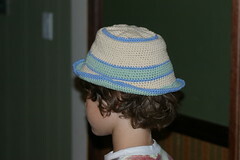 The firmness of the cotton and the tighter gauge makes the hat hold up well. 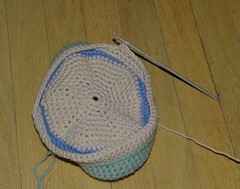 I’m trying my hand at crocheting, too, after so many years. I can’t believe how stiff my fingers get, I’m all tense to the point where my left hand is tingling. I’m working on the relaxation bit. This is the Pork Pie hat from Knit.1 There are a number of errors in the directions. I’m sending them my observations so they can include them on their errata page.